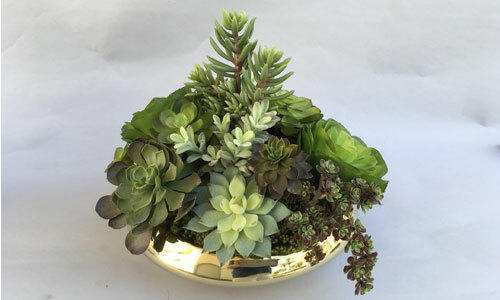 Pacific Silk Plants provides interior designers with the finest artificial flower arranging services in Orange County. Over the last 30 years, our locally owned shop has worked with thousands of satisfied clients throughout Newport Beach, Mission Viejo, Laguna Niguel, San Juan Capistrano, Dana Point, and surrounding cities, and built a reputation for excellent customer service, attention to detail, and quality work. Because of their elegance and timeless appeal, our silk plant arrangements are often kept on display for years in showrooms, office lobbies, and main foyers as floral centerpieces. All of our silk plant arrangements are crafted by our own in-house floral designers -- not arrangers or assemblers--and made with faux flowers, orchids, succulents, and trees sourced from the industry’s premier manufacturers. In order to maintain our high standards, our talented designers hand select each and every silk botanical piece, and use the best wiring techniques, hand-dyed mood moss, and long-lasting liquid floral foam injection. As a result, our artificial floral arrangements always meet or exceed client expectations. Visit our San Juan Capistrano shop today speak with one of our helpful and knowledgeable in-house floral designers. We can work with you to create a completely customized floral arrangement or help you choose from our broad selection of line arrangements (viewable in store or on our website). Professional designers receive special trade pricing and courtesy services. Additionally, we can ship to anywhere in the continental United States and provide local on-site consultations, delivery, and installations for select projects. Pacific Silk Plants goes to many wholesale and furniture trade shows throughout the country and has a permanent booth at the World Market Center in Las Vegas for the summer and winter shows. We hope you’ll stop by and see us!